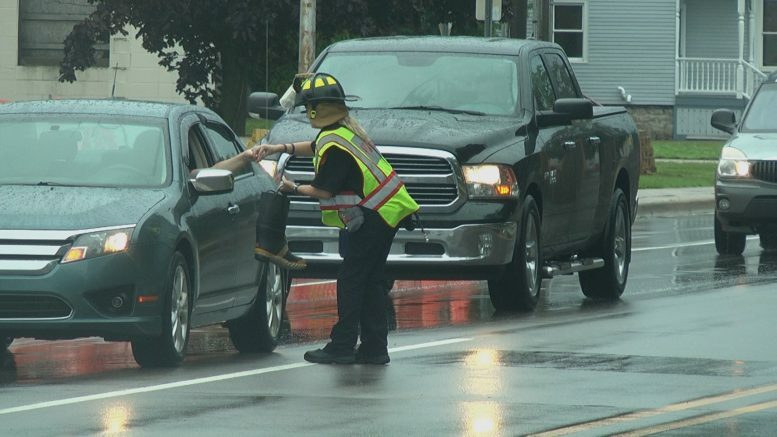 An Alpena City Firefighter takes a donation for their annual fundraiser "Fill-The-Boot" on a rainy Wednesday afternoon. Alpena — Firefighters paced up and down the center of 9th Avenue and Chisholm Street, collecting donations for the Muscular Dystrophy Association. This annual fundraiser has been going on for over 50 years all over the United States. The relationship between firefighters and the Muscular Dystrophy Association began when a firefighter’s child was diagnosed with the disease. The fire department banded together to help raise funds for the child. The act sparked a relationship that has been ongoing ever since. Alpena City Firefighters honored that tradition this afternoon. “We got into this profession to help people and this is just a continuation of that, of helping people, helping our community, and helping the public in general,” said Stachlewitz.